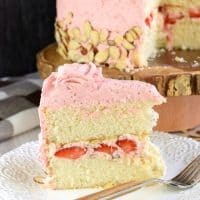 This is The Best Strawberry Almond Cake recipe with a moist almond layer cake with strawberry buttercream, sliced almonds and fresh strawberries! I know when most people think of Easter and Spring they think of carrot cake. But what about strawberries? Soon here in the midwest our gardens will be overflowing with this juicy, flavorful fruit. Unfortunately though, I’ve always struggled adding fresh berries to frosting. It makes the frosting really soft and watery. Freeze Dried Strawberries. You can pop them in a food processor or ziploc bag to make crumbs. And, the only ingredient in them is STRAWBERRIES. No extra junk, and all the flavor you crave. Know what goes great with strawberries? Almonds. 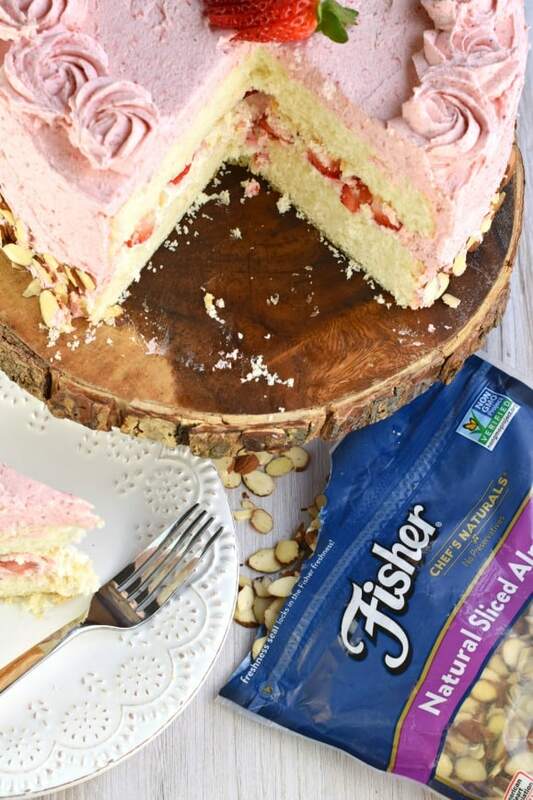 Fisher Nuts Sliced Almonds are fresh from the package with no preservatives or GMOs. 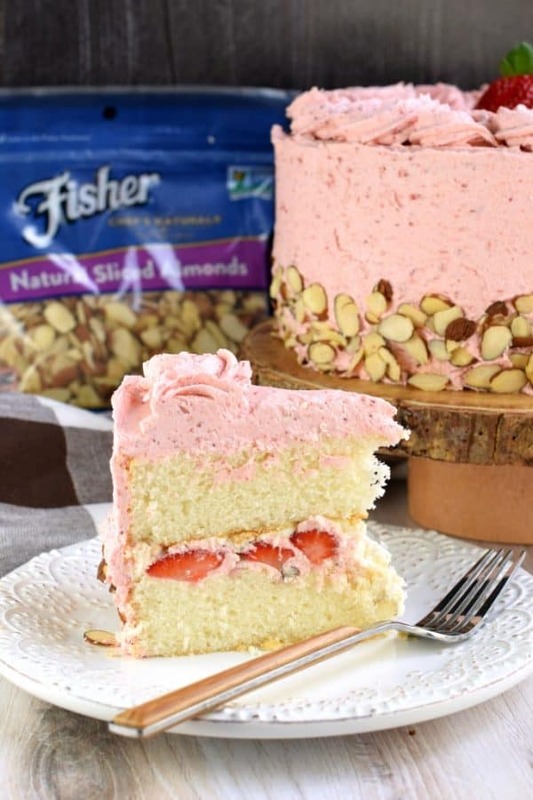 Put the strawberries and almonds together to create this delicious Strawberry Almond Layer cake! Grease and flour two 9-inch cake pans and line bottoms with parchment paper circles. PRO TIP: Use bake even strips to keep cakes level with no waste! Set aside. Preheat oven to 350 defrees F.
For the cake. In a small bowl, whisk egg whites with 1/4 cup of the buttermilk. Set aside. In a medium bowl, combine cake flour with baking powder and salt. Set aside. In a large bowl, beat softened butter with granulated sugar for several minutes, scraping down the sides of the bowl as needed. Beat in almond extract. Add the dry ingredients slowly, until combined. Slowly add in the egg mixture, beating until well blended. Finally, beat in the remaining buttermilk. Pour batter evenly between the prepared cake pans. Bake for 25-28 minutes, until lightly browned and toothpick inserted in the center comes out clean. Remove from oven and cool in pans 5 minutes. Then invert onto a parchment paper lined wire rack (the parchment keeps the cake from sticking). Cool completely. For the frosting, beat room temperature butter with powdered sugar, milk, and almond extract. Beat for about 4 minutes until fluffy. Remove one cup of the white frosting and set aside. To the remaining frosting, add in the crushed freeze dried strawberries until blended. To assemble the cake, lay one cake layer on cake plate. Spread WHITE frosting over the top of this layer. Add the fresh, diced strawberries and 1/4 cup of the Fisher Nuts Sliced Almonds. Top with second layer of cake. 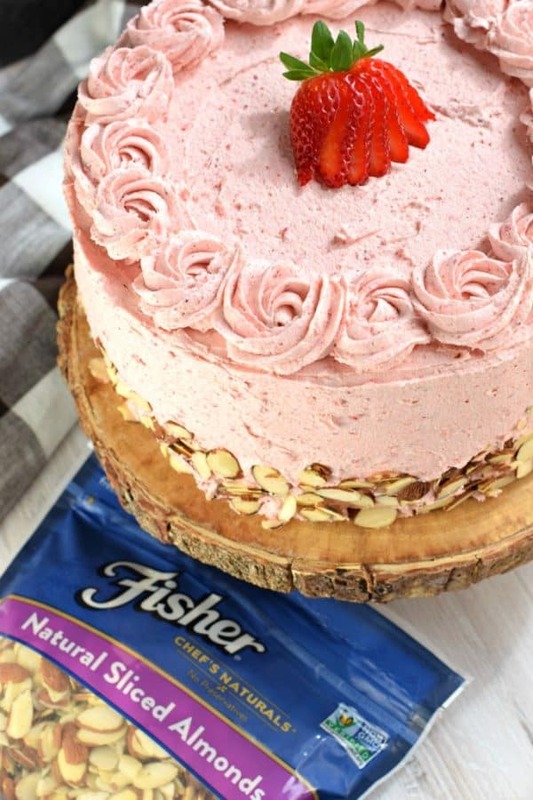 Using an offset spatula, spread the remaining strawberry frosting over the sides and top. Feel free to use a piping tip to add swirls, if desired. Once all the frosting has been applied, use your hands to press the remaining sliced almonds onto the side of the cake. To give it a beautiful finish, I only added almonds to the bottom third. If desired, add one fresh strawberry on top! Keep cake covered until ready to sever. Can be refrigerated. ENJOY. 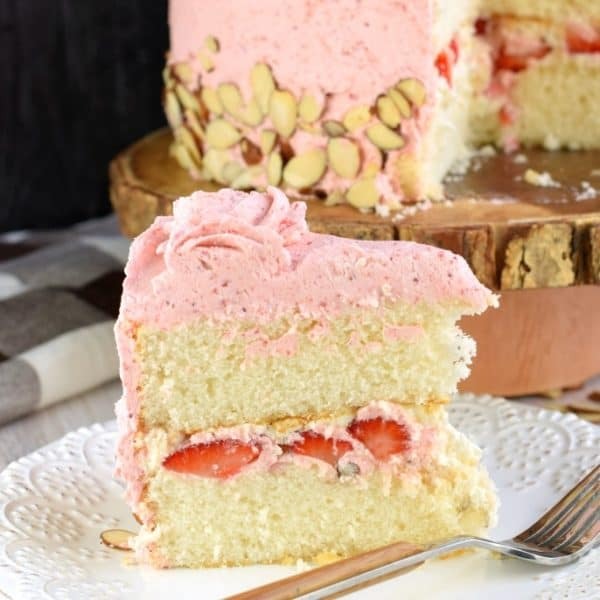 Can this Strawberry Almond Cake be made ahead of time? Typically when I make cake, I bake the layers one day, then the next day I whip up the frosting and assemble. Sometimes I even assemble the day before. 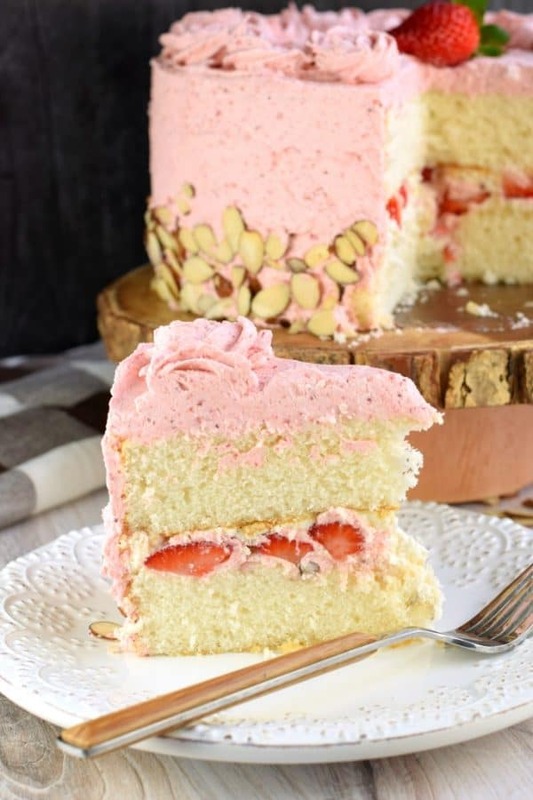 Today’s strawberry layer cake can be made the day before. The only caveat is you may have some of the fresh strawberry “juices” leak into your white frosting and cake. If that doesn’t bother you, then go ahead and make this a day in advance. Yes! Sometimes you can’t help but have leftover cake after a holiday or party. If that’s the case, I slice the cake into large chunks, wrap them in plastic wrap, then slide them into a freezer safe ziploc container. These cake slices are best within one month. I’ve been a partner with Fisher Nuts for 6 years. During that time I have made everything from snack mixes, to cheesecake bars, to brownies. At any given time you can open my pantry and find numerous varieties of Fisher Nuts. I love the pop up bag that has a zip closure, it’s perfect for snacking! Chewy and nutty, these protein packed Peanut Butter Quinoa Protein Bars are the perfect post workout snack or breakfast on the go! Packed with flavor, and heart healthy almonds, you’ll feel great choosing this as a snack or meal! This gorgeous, from scratch, Strawberry Almond Cake recipe features a moist almond layer cake with strawberry buttercream. Fresh sliced almonds and strawberries to added flavor and texture! Grease and flour two 9-inch cake pans and line bottoms with parchment paper circles. Use Wilton bake even strips to keep cakes level with no waste! Set aside. In a small bowl, whisk egg whites with 1/4 cup of the buttermilk. Set aside. In a large mixing bowl, beat butter with granulated sugar, for 2-3 minutes until creamy (scraping down sides of bowl as needed. Add the dry ingredients slowly until combined. Slowly add in the egg mixture, beating until well blended. Finally, beat in the remaining buttermilk. Pour batter evenly between prepared pans. Bake for 25-28 minutes until lightly browned and toothpick inserted in the center comes out clean. Remove from oven and cool in pans 5 minutes. Then invert onto a parchment paper lined wire rack (to keep cake from sticking). Cool completely. For the frosting, beat butter with powdered sugar, milk, and almond extract. Beat for about 4 minutes until fluffy. Remove about 1 cup of the white frosting and set aside. To assemble. 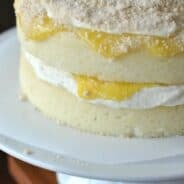 Lay one cake layer on cake plate. Spread WHITE almond frosting over the top only. Add the fresh, diced strawberries and 1/4 cup of the sliced almonds. Top with the second layer of cake. 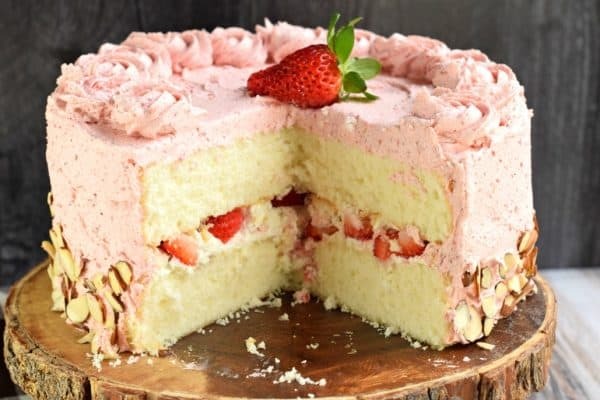 Using an offset spatula, spread the remaining strawberry frosting over the sides and top (feel free to use a piping tip to add swirls if desired). Once all the frosting has been applied, use your hands to press the remaining sliced almonds into the side of the cake. To give it a beautiful finish, I only added almonds to the bottom third. If desired, add one fresh strawberry to the top! Keep cake covered until ready to serve. Can be refrigerated if desired. ENJOY. Love this! It’s fresh and moist, and my family loves it. 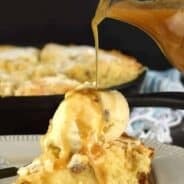 Going to make this for Mother’s Day! A stunning cake and so delicious. WOW!! This cake is absolutely ahhmaaazing!! I would LOVE a slice! 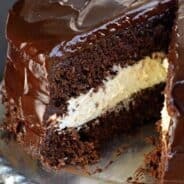 This cake is right up my alley! 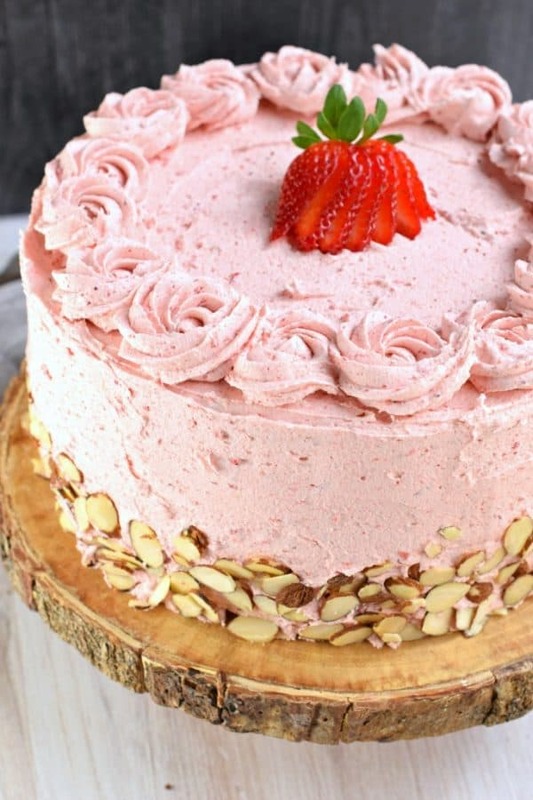 LOVE the strawberry frosting! looks delicious can’t wait to try it myself, kudos for the effort!